Every year Julie and I write down our plans for the next year. Plans change, priorities change, things come up but it gives us something to shoot for. For example, we may say we want to put $X toward savings every paycheck, buy a milking machine, buy a shotgun and expand into a new market on the farm. Every year the shotgun gets pushed off. Like I’m supposed to be happy with the guns I’ve got or something. We remain open to changes in our plans. Our 2013 list is not yet final but includes a shotgun (again), exercise our option on the remaining 40, fix the roof on the back addition, seed clover in the pasture, buy as many as 8 beef cows (shorthorns would be awesome! ), set up a Facebook page for Chism Heritage Farm and a few other personal and financial goals. I would also like to try raising quail this year, though they are not cheap and require a high-protein feed. During our summer lull I would like to pick up 50-100 of them from our friends at Cackle Hatchery and see what it’s all about. This will also be the year of planting trees. I plan to plant many more trees than I cut down and I have to cut down a lot of thorny things out there. But, though all of these things are good they may not be the best thing for me. All of these are subject to the will of God. I have no idea what tomorrow will bring. He does. Don’t resolve to lose weight this year or give up chocolate or promise yourself to write a post every stinking day to your family farm blog. Avoid guilt-driven goals. Consider things you can measure and actually complete. Things you know you need to do but won’t if it is not written down somewhere staring you in the face every day. Make plans that are their own reward. Don’t congratulate yourself for losing 5 pounds by eating a cupcake. Prevent yourself from mowing the pasture and lower your food bill by getting some cows. Then lose weight by managing the cows. Then eat the cupcake! ‘For I know the plans I have for you,’ declares the Lord, ‘plans to prosper you and not to harm you, plans to give you hope and a future’. We list out our plans. We pray that our plans are inspired by God and not by greed. We work toward our plans. Sometimes God redirects our work. Sometimes things just come up. Even if you don’t believe in God, it’s far better to take a moment to think about where you are trying to go rather than allow yourself to drift aimlessly. So here’s a quote from Alice in Wonderland for those who don’t share my beliefs. We maintain our plan. We have direction. We reference, update and maintain our plan. We take steps each day to achieve our goals. Even a little at a time. This is not a recipe for food. It’s an example of walnut and hackberry tree guilds. They go together like peas and carrots. I didn’t realize this until I read Gaia’s Garden but I have hackberry trees next to my walnut trees. Now, to be fair, I have hackberry trees everywhere. But I also have oak trees everywhere…except where the walnut trees dominate. So, here is a walnut tree. And here is a hackberry next to it. Walnut in the foreground, hackberry in the stream and more walnuts up the hill a bit. Now, these guilds would be much more complex if the cattle hadn’t been run through the woods non-stop for at least the last half-century. Really, the only trees that have not been grazed immediately after sprouting are the ones with thorns. Neither the hedge nor honey locust seem to be bothered by the juglone. And they are making more thorny things for my pasture. Look at those thorns! I really have to replace my honey locust with black locust. I’m all in favor of fixing Nitrogen but not at the expense of my foot. I had one go all the way through my boot last year. I can’t let these seeds germinate. Back on topic. Need more? How about this? Hackberry, walnut and grapes with a side of Virginia Creeper. Both trees are alleopathic but, in a guild, can function to allow other plants to grow as well. The book, which in this section is slanted toward the west, suggests currants and wolfberries. I don’t even know what a wolfberry is but we do have currants. We also have gooseberries. With proper management, and a bit of luck, I should be able to get ahead of the thorny things and maintain the existing tree guilds while establishing new trees to increase plant diversity. I just had to learn to see the forest for the trees. What do you see out there? We have some old friends. Close friends. Dear friends. Mentors even. Friends we homeschool with. Friends we play cards with. Friends we laugh with. Friends who took time to show us how to butcher a hog. You with me here? Friends who care about their livestock. Who want their animals to be raised under the best of conditions, under the best of care, in the best of health. They approach it with a different paradigm. They just built a new building to finish 2,500 hogs. At once. Each hog will eat around 700 pounds of feed. The feed is mostly corn. Corn weighs 56 pounds per bushel. Soybeans and oats weigh 60 pounds per bushel. You get an average of 50 bushes of beans per acre where I live, 100 bushels of corn, 100 bushels of oats. I mix 2 parts corn, 1 part beans (roasted) and 1 part oats along with minerals in my hog feed. So it takes approximately one acre of corn, one acre of beans and half an acre of oats to raise 16 pigs. Without going into the intricacies of finance and large-scale construction I’ll just say that’s fine for commodity growers. We have found a niche by raising pigs outdoors on a seasonal basis and retailing them directly. I’m not interested in passing judgement or saying one is better than another but I am happy to say there is a market for pigs raised on pasture. Please understand this makes me the odd duck. As usual, I’m the weird guy in the room. Also, my friends make a living raising hogs and I…well…don’t. Maybe I could though. If you ask our friends about animal health and happiness they will tell you emphatically that their pigs are as happy and healthy as a pig can be. They rely on veterinary services to keep their animals healthy including weekly video conferences with the vet contracted by the vertically integrated growers. They rightly point to the range of climate control options available to reinforce their point about animal welfare. Their pigs don’t shiver. Their pigs stay shaded, misted and reasonably cool on hot days. Ask me about animal health and happiness and I will tell you emphatically that our pigs are as happy and healthy as a pig can be. Our pigs get no shots, they have their noses in the mud but they do pant when it’s hot and they do bury themselves in straw when it’s cold. Ask either of us if we are stewarding the environment and both will say yes. Our core asset is not our hog management facility. It is not our pig happiness index. It is not our eco-score. Our core asset is our flexibility. Ask our friends what else they could raise in their hog buildings. Ask me what else I could do with that pasture. Ask me how much debt I have on my pasture compared to the debt they have on their building. Then again, ask them about the labor efficiency they gain by using a building. Ask them about the performance gain by keeping the animals dry and warm all winter. Ask them what they make a living doing. We are very different in how we raise our hogs. I specifically don’t want to say we are better. I recognize I am the odd duck in the neighborhood. I also don’t want to imply that I am in competition with them. I’m not. I satisfy a small niche in our community. They help satisfy commodity demand across several states. Totally different world. Sometimes a man just wants a pound of bacon. But sometimes you want pork that carries other flavors; pork that tastes like acorns, walnuts, mushrooms, alfalfa, hickory nuts, and fresh air. I can’t provide that for the larger market. I can only provide it for your house and mine. Different focus. …or maybe something like this which is quite similar to Mike Butcher’s place up North. Is this the future of hog production? Instead of millions of gallons of liquid manure, we could have tons and tons of finished compost. Instead of single-purpose hog finishing buildings we could have multi-purpose hoop houses. I could raise chickens, rabbits, pigs, and zucchini in the same space. Add heat and I could raise orchids…with compost the pigs made. Pigs can dig, flop, roll and rest in warm bedding. They can find interesting things to eat and (probably) receive all the inoculation their immune systems need right from the bedding. It’s an exciting time to be a farmer. There are exciting problems to solve and a whole internet full of people sharing their solutions from around the world. Do we need 2,500 head confinement operations? Right now, customers say so. Do we need 10 head pasture operations? Customers say so. Should we fiddle with what works? Curious farmers say so. Here’s to innovation. Let me know what works on your farm. Total. Complete. Unequivocal. Failure. Well…failure-ish. You’ll see what I mean. So, Chris, how much money did you make this year? You ready to buy some additional land and quit your job and farm full time? No. Not really. Maybe more land since grandma passed and we need to exercise our option on the East 40. But I’ll be sitting at a desk for a long time to come. I don’t want to publish my whining for all the internet to see. Many our readers share our dreams and I want to present a realistic picture of what goes on here. We have a ball on the farm. Not every day but overall it’s a hoot. Part of the fun is laughing at ourselves and learning from our mistakes. Learn with us. Also, I want to make clear that if we do make it as farmers it will be because of my own incompetence. Give me the chance to hand the reins to one of my children and I’ll run out of the way. They are the future of the farm. Thank God. We sold around 950 broilers this year (600 were cut-ups). Add to that 14 pigs, 3 goats, around 200 pullets, a dozen or so stewing hens, and, based on some back of the envelope math, 1,000 dozen eggs to date. Pulling out our little envelope again I calculate that we sold roughly 7,500 pounds of meat from our little 20 acres. This doesn’t count the 600 or so bales of alfalfa hay we put up, bushels of produce from the garden, duck eggs, a gallon or so of maple syrup or the fish we caught from the pond. I am also not including the pigs we butchered for ourselves (3), chickens we ate (about 1/week), the three turkeys we raised for ourselves, the four goats we still have, the three cows we still have or the mountains of walnuts I have ignored in the pasture. All from 20 acres. Any money we made was poured back into fencing, livestock housing, repairs on equipment or new equipment. Julie and I didn’t take a dime in pay. There is just enough left to carry our pigs through the year and start up again in the spring. We (quite literally!) worked our tails off. It shows. The barn is full. the pasture looks 100% better. Our freezers still have a little inventory. Our larder is stocked. But there’s no cash. Business failure. Each year we add to our infrastructure with whatever little money we make…and it just keeps sucking whatever money we can pour into it. All so I, with my limited ability, can flirt with disaster hoping and praying someone somewhere will buy another dozen eggs. Begging friends and family to take a free chicken, taste the difference and tell a friend, scrambling like a madman to hustle another half of pork. Nearly every customer returns. I couldn’t tell you what percentage but I can tell you their names. They return telling me they can’t stand store-bought eggs anymore. The pork is the best they have ever eaten. They are grateful they can trust that our chickens are clean and safe to eat. But there is only so much pork and chicken a customer will buy. I need more customers. More customers mean I have to produce more food and anticipate demand. I have to attempt to anticipate the needs of the market when increasing my production. Take my chickens for example. Right now we are looking at sales figures from the past few years and looking for consumption patterns. This is information we didn’t read in any books or blogs. It looks like customers really want spring to arrive early because we have many requests for whole birds in February and March, the time when our freezers are empty. Fried chicken is popular for Mother’s Day, Memorial Day, Father’s Day and the 4th of July. Then there is a period in mid-summer when the heat sets in and nobody wants to cook anything. I have to sell out before the drought starts (whenever that happens) and have empty freezers until I butcher again in the early fall. I can’t order chicks when it’s 100° outside or they will die in the mail so I can’t order chicks until mid-August unless I drive to the hatchery. Then I have to have them off of pasture before the second week of October so the pasture has time to recuperate before we get a hard freeze. Besides, in October the sun goes down early and the chickens stop eating early and grow slowly. I have to hit a small window with just the right amount of production to meet fall and holiday demand as well as carry enough inventory to last until I butcher again because, as I said, there is a late winter demand for chicken. And don’t get me started on anticipating commodity prices. Should I buy corn out of the field? Is it better for me to buy bagged feed from the elevator or grind it myself? What will prices do in 6 months? Ugh. Chick prices are already up. I have to find a way to grow animals, grow my business, remodel and reshape the farm landscape in a positive way, continue learning sales, farming, accounting, tax laws and researching Illinois chicken regulations. All this as a part-time job I can only squeeze in evenings and weekends. Thank you for reading our blog. If you’re in the midwest, I hope you are safe and warm someplace cozy during the storm that’s coming through. Maybe a book and a warm cookie in hand…even if Christmas isn’t your bag. There’s no shortage of work to do here but we’re taking a couple of days to just relax with the kids. Merry Christmas. What a mess. What a total mess. Cows out of their designated grazing area! Fence isn’t shocking! Nothing works and it’s near absolute zero after factoring the wind chill! Thursday we had a winter storm blow through. It began with a thunderstorm and 30 mph winds and sideways rain. Lots of rain. When I got in my car at 6:30 am to drive to work it was 54 degrees outside. When I got to work at 8 it was 34 degrees outside and the wind had picked up to 50 mph. Then it started snowing. When I drove home in the late afternoon I followed a semi pulling a trailer. The trailer was being blown by the wind and wagged behind the truck like a dog’s tail. We didn’t bother bringing the cows in. They know where the barn is. They had been in the barn recently but they know better than I do where they are most comfortable during a storm. They found a sheltered place down in a valley and hunkered down for the night. We put a few obstacles out by the layers to give them some relief from the wind and noticed several chicken tractor lids had taken flight and nearly landed in the pond. Goats were warm, pigs got a whole new bale of straw, ducks were just ducky so we told the kids to sleep downstairs by the wood stove, built up a big fire and went to bed early…praying that the power would stay on all night but ready if it did not. The power stayed on but the cows got out just the same. At milking time we brought the cows up to the barn to milk. They were feeling ornery and walked the long way around. Cows! Once up, it was time to start looking at the fence. The charger was ticking but not lighting up. It was shorting out somewhere. That’s the worst. The place to start is to turn off half of the fence. Part of my fence is pretty OK. The other part is…well…servicable. All of it is legacy fence, built by grandpa’s hired men or cousins of mine over the last 40 or 50 years. I trust the newer part…mostly. So I cut the switch. As expected, this made no difference to the fencer so I knew which way to begin the long march around the combine shed, through the iron pile and back around the house. Then I found it. The fence was touching an iron corner brace. This is one of the wonders of fences built by hired help. Oh well. New fences are in the works anyway. I separated the wire from the pipe and continued my inspection. Not too much fence to walk between break points. Then I had to walk the strands of fence we use for the cows current pasture, checking at each rebar post to make sure the wire wasn’t touching a post. There were a few problems to work out along the fence until the end. At the end, the spools were supported by another rebar post but the wind, rain and gravity had knocked that post over. I cheated by hanging the spools off of the perimeter fence. Well, that’s what it looked like later. I didn’t realize I created a new short on my own. Nothing worse than fixing one short and creating another. Had to walk back out to fix it. That’s what I get for taking a shortcut early in the morning in the cold wind. Back up to the fence charger and it was at full charge. Now, I don’t want to pretend it was all work and I don’t want to say I was all alone out there. I had help. But what is the fun of having your own cemetery hill if you can’t sled on it? So I made a few trips down myself. The railed sled has carried me downhill for 30 years that I remember. Dad would carry it up the hills because I just wasn’t strong enough when I was little. That sucker gets heavy after a few trips. Now I carry it up the hill for my kids. Good times. The storm made a lot of work for us today but it also gave us a chance to play before breakfast. Hope the storm gave you something fun too. Well, Charlie, I just read the book and I’m different already. 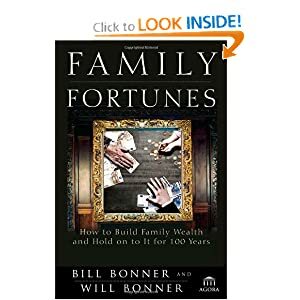 We have been reading Bill Bonner’s Family Fortunes slowly over the past few months, taking our time, chewing through it and pausing to ruminate on concepts presented chapter by chapter. I am the latest in a long line of family farming the same ground but, unfortunately, there is no family fortune. We have eroded, North-facing hills, very little fertility and a couple of nickles. We are lacking Bonner’s description of a council of family elders, a family bank and millions in cash and equity available for investment in coming generations of family entrepreneurs. I didn’t inherit the land I live on. I am buying it with money I make, not money my dad gave me. The only wealth I recieved to date from mom and dad was my faith, my work ethic and an insatiable desire to learn. College was not a choice and was on my own dime. Family sweat, not family cash, helped us reclaim the farm from the thorns and brambles and that’s where my dad has really contributed to the cause. We have spent years clearing thorny things out of the pastures and fixing fences with years of work still ahead of us. My job is to hold onto this land so the next generation can take the reins from me. If I do my job well they will not only have the opportunity to inherit the ground, they will be getting something of greater value than I did. That’s stewardship. Bonner talks about the need to follow a well-worn path in business…doing something that others have already succeeded at. We read and follow the examples of leaders in alternative ag. He talks about how important it is that I not try to go it alone, that I work hard and take one bite at a time until I “find something that works before you run out of time, money and confidence” (p. 126). He goes on to suggest a farm as possibly the ideal family business on page 141. What is the ideal family business? Hard to say, but it might be a large, diversified family farm. It is a difficult business, perhaps with relatively low returns on capital. It requires active, on-site management. There is generally little liquidity, and a “liquidity event” is a very big deal. The main asset – land – compounds in value without capital gains or income taxes. What does this have to do with anything? Our greatest assets are our children. We work hard to teach our children right from wrong. …that we are endowed by our Creator with certian unalienable rights. To teach them when to speak and when to be silent, when it is appropriate to joke around, what topics are appropriate sources of humor and which are taboo and when to push the envelope. We work hard and always put something away for a rainy day. We think about what we feed our bodies and what we feed our minds. We are careful about what sources of entertainment we choose and how much we allow ourselves to be entertained. We love each other. We value life. We value community. These ideas define us. More to the point, they shape us and build us as a unit and create our family culture. Though family culture could develop anywhere, Bonner presents that certain locations can function as an incubator of the family. A place to hole up during a period of unemployment or just a place to relax and write a book. I like these ideas. Years ago I hit a crisis point that caused me to re-evaluate my purpose in life and, ultimately, forcing me to re-invent myself. This happened in the home with my family beside me. We stayed in our stronghold (playing Mario Kart Double-Dash!) for an entire summer together. That house in town functioned as a stronghold for a time but, ultimately, it was too small for our needs. We, as a family, felt a calling to grow beyond a garden and a couple of chickens. Strangely, we find it to be easier to be involved in each others lives on 20 acres than on 1/8th of an acre. We have common goals and interests but still have space for individualism. Bonner suggests “Your stronghold should be a place where you can live almost indefinitely on local resources” (p. 302). The stronghold should be well provisioned beyond just wine and firewood and it should be fully paid for. If the goal is to have a refuge point during a period of personal crisis, you shouldn’t be worried about paying for it or what you will eat. Well, we’ve got the firewood, a little food in the pantry and are planting fruit and nut trees. Our efforts at canning food are increasingly successful and our gardens are better every year. These things are nice but the big one in the list is just having it paid for. Ugh. We are nowhere near paying for the farm, though it is high on our priority list because it is difficult to do anything in debt. Mostly, though, it’s because I want to leave my children more than a legacy of debt. This house…this stronghold is our last refuge from the world. The place we feel secure from whatever the world throws at us (including 50 mph snow storms). If nobody else believes in us, if we fail at everything we have tried, when we are down on our luck and feeling blue this place is home. This is not just the place where we hang our hats, it’s the place we return to after our long and weary travels. The place we want our children to return to….their children to return to. A place generations of us have come home to. It is our stronghold against the world if necessary. Our job, a job we have chosen, is to start from nothing on worthless (but expensive) ground in a worn out, drafty house with a leaky roof and build something lasting. Our job, as a couple, is to lay the foundations of lasting family culture and plant the seeds of future wealth. Time is on our side. The overall goal has nothing to do with farming (or even money for that matter) but building a family. This farm is just where it happens. Obviously I liked and recommend the book. Be careful reading it though. It’s likely to light a fire under your tookus. Would you rather have dirt or Dollars? Like Neo being offered the blue or red pill, my father asked me the same question. Taking the red pill was the obvious choice. This one is tougher. Wanna see just how deep the rabbit hole goes? Which would you rather hang on to for the next 50 years? Holding cash during a period of inflation is a bad thing but uncertainty abounds. Yes, our beloved central bank has been trying to cause serious inflation for the last 4+ years but they haven’t succeeded yet…though they have been wildly successful over the last 100 years. Let’s be specific about land and dollars. There is an 80 acre plot of land North of my house owned by my grandmother’s estate. Let’s just play with the biggest numbers I can reasonably imagine and using money I don’t have. I can’t buy this ground so I can do this without emotion. What if it sold for $10,000/acre? Would it be better to buy $800,000 in CDs at the bank for 1.7%? That would earn $13,600 annually. I could make the same money renting the ground out for $170/acre BUT I would have to manage a tenant. CD rates are at their bottom and COULD go up. We have never gotten that kind of money as rent for an acre of that ground. Looking at history, the value of the dollar has gone in one direction for the last 100 years. Down. The dollar has lost 95% of its purchasing power since 1913 and 35% since 2001 (check the dollar index). As that trend continues, putting $800,000 in a 2% CD would cost me 2-3% annually. If that trend accelerates…! Land has had its ups and downs and is currently way, way up. Land may crash in value but will always be worth something. Given the trend in dollar value, land should continue increasing as expressed in dollar terms. Since investors are chasing yesterday’s returns and farmland was worth a mere $5,000/acre yesterday could it be worth $20,000 tomorrow? As a speculative bet, knowing I have the central bank and a large trend on my side I would rather put my money in land. I spoke to one of the old timers in the neighborhood and he agreed. In fact, he said if you have any cash at all you should put it in land as there is no use putting it in the bank. I’m a little bothered that he’s an old timer. I can remember when he wasn’t. What does that say about me? While dollars are more portable and are infinately liquid (at least for now), land stays put and is illiquid. If you choose to own land you are making a decision to put down roots. By buying the land I have married myself not only to the farm but also to Illinois. Illinois, kids, is broke. Brokety broke. There is absolutely zero possibility of Illinois meeting their future obligations. The promises they have made are just too big and, unlike the federal government, Illinois can’t just print their way out of their problems. But they will try. I fear for the “rich” farmers sitting on millions of dollars worth of equity. If you equate property tax with wealth tax and view the land owners with envious eyes, it is easy to see what should be done: increase property taxes to punish the rich. This supports a case for owning something Aristotle described as being more liquid, more portable, easily divisible, intrinisically valuable and durable. But that’s a subject for another day. Dollars allow you to buy productive assets or consumer goods. Land is a productive asset and is difficult to consume. The increasing land prices don’t stick me with capital gains year after year but does allow me to create value. I could raise 40,000 broilers, 80 cows and 300 pigs on the same 80 acres not to mention 10,000 dozen eggs. I could also harvest chestnuts, walnuts, pecans, fence posts, firewood, maple syrup, dewberries, deer, squirrels, rabbits and fish from that same 80 acres year after year. While I don’t want to imagine what an employee would cost, that’s easily $200,000 worth of production after expenses and may even pay the taxes! And who knows what beef or milk will sell for in 5 years. Given my vision, my talent, my desire to serve my community and heal my land, I would happily part with $800k in exchange for 80 acres. Grandpa paid $10,000 for it 50 years ago but those dollars are all gone. The land is still here. I choose land even if I’m only a little bit Irish. Mom’s family has been here almost as long as the state has existed. I think there is even a shalali in the basement. Many of my mother’s fathers didn’t buy the land, they inhereted it. I bought it. Either way, we have to work the land to make it pay. I can see and feel and understand how to make land work. I know you can make money work for you but it’s a very abstract concept I just don’t understand especially in the current environment. I haven’t published my walks in the pasture for several months. It got dry, hot and turned brown. Where the pigs were we grew the most amazing oats, rye and turnips. The pigweed was beyond belief. You’ll just have to take my word for it. Now it’s December. …if we walk South and look North you can see some of the battle scars. Pigs. I love pigs. Truly, I do. They are so much fun when they are little, so tasty when they aren’t little. They dig, root, manure, eat, scrounge and play. Look closely and you can see where the fences were this fall by the berms the pigs built rolling dirt with their noses up to the fence line. Look for various piles of wood chips used to fill in everywhere the pigs made wallows. But, in the aftermath of pig surgery we had the nicest stands of oat, rye and turnip you could ask for and the cows said thanks. At my feet there is an area under the walnut grove that grows little other than henbit and chickweed. Both of these are welcome as is the daikon radish that apparently isn’t going to make it. Oh well, it will rot. Around the hill a bit further South my oldest son and I have marked out a location for a swale. A swale is just a ditch on contour. It can be inches or feet deep, inches or feet wide. But the point is, it holds water back so it can’t rush down the hillside. Instead, it slowly infiltrates the soil and meters the water into (not over) the landscape below. I’m really itching to get a swale established here as well as plant a number of trees above, on and below the swale. More on that another time. Down the hill further south and you get the slope featured in the July pasture walk. The slope was entirely covered in chicory. It still is. Soon the freezing and thawing action on the hill will break the stems and the stems will fall over. Next spring it will come back looking like dandelion leaves but with a red vein in the center of each leaf. I can’t wait. Then I spy a thorny nemesis. If not for the thorns I would really like honey locust. They are pretty, smell nice, make a useful seed, and are a legume. But then there are the thorns. A honey locust thorn went completely through my boot and foot one day last winter. Those trees need to go. A little to the east I have to stop and root for a little plantain plant. Come on little buddy! Crossing the bridge a little further East I find another tree. I am less adamant about ridding the farm of Osage Orange than I am Honey Locust. They are thorny, yes, but they make fence posts that will outlast me and awesome firewood. I’m torn. Well, not with this one. It is in the wrong place and has to go. Wrapping up and heading home, I’m amazed at how much grass is left after the cows grazed the hillside a month ago. At that time they wouldn’t touch the fescue. I also notice how much clean-up I need to do on this hill. Every night the cows come up to the shed where we feed them hay. We do this so we can separate the calf so there will be milk for us. In the morning, we milk while feeding them dried molassas and oats with a turnip, beet, daikon radish or whatever we can find. Otherwise, during the day, the cows are still grazing. Horses too. The world is frozen this morning. Cows, goats, chickens and pigs all get ice water. Cows are having frosted fescue and ryegrass. We’ll continue grazing our way around the North side of the combine shed and into the pasture to the West. That amounts to about 2 acres of grazing that hasn’t been touched since about September (when I finally fenced my cousin’s cows out of my pasture). Little by little we move the electric fence opening more grazing area. I don’t have a back fence up on this pasture as the grass is pretty much finished. Then there are another couple of acres to graze in the bottom when we get around to it. The cows on the next hill are the neighbors and they are grazing wheat and turnips that were sewn when the corn was tall. I can graze the bottom just down the hill from grandpa tree. That too has been untouched for several months. It would be better if it had rested since July but…next year. Unfortunately it’s not wheat and turnips. It’s fescue and goldenrod. Ah, goldenrod. These leaves are pretty much what is left of goat pasture. Poor goats have been on hay since the leaves fell. The horses don’t seem to mind the fescue so we’re stretching their hay by rotating them where the cows have already been. I have a hill near the horse barn that is a solid mass of fescue foot deep. The horses do a good job grazing it down to the nubbins, fertilizing the ground and tearing it up with their hooves. This will make a good seed bed for clover in the late winter. So that’s the state of things. We encourage the cows to graze as frost makes the fescue more palatable. The horses munch, stomp and deposit. The goats nibble leaves and seed heads where they can find them. We keep notes on what is out there and are determined to do better next year. Higher plant populations, greater diversity, more palatability, taller grass, more stockpile, fewer weed trees….the list goes on. It’s mid-December and we’re still grazing and I feel pretty good about that. Hope this keeps up.